On the left, the iPhone. On the right, the iPhone 3GS. 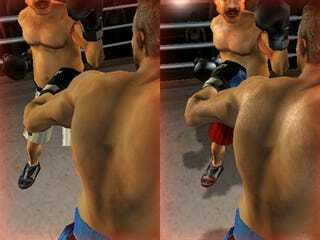 Iron Fist Boxing 3 shows us a graphical divide we can expect only to grow as more games push the iPhone 3GS hardware to its limits. We've known this day would come. The iPhone supports OpenGL ES 1.1. The iPhone 3GS supports 2.0. Plus, the iPhone 3GS has more overall processing power. iPhone 3GS: Just How Awesome Are the Graphics Gonna Get, Really? In real world terms with Iron Fist Boxing 3, this means you see shadows, sweat and bloom lighting (edit: experts in the audience say it's technically specular mapping) while playing on the 3GS (all of which you'll notice in the lead shot). Plus, you'll notice additional in-game effects like motion blur on the 3GS, too. Still, the 3GS only handles this advanced content at 30fps. The graphic improvements can be turned off so the handheld can reach 60fps.